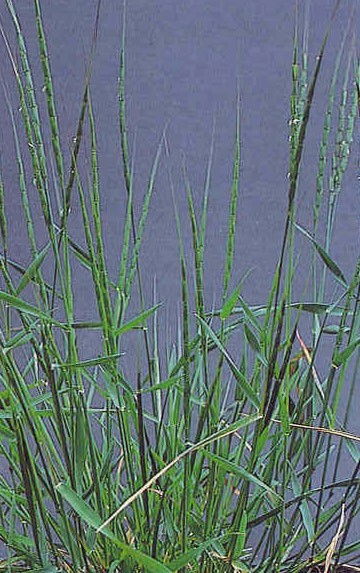 BACKGROUND: Jointed goatgrass is native of southern Europe and western Asia. It is also closely related to wheat that both species can interbreed. It is difficult to distinguish from wheat until spikes appear. It spreads exclusively by seed. Jointed goatgrass grows best in cultivated fields, but can also invade grassland. DESCRIPTION: Jointed goatgrass is a winter annual, but about 5 percent of a populations may be spring annuals. Leaves are grass-like, up to a 1/2-inch wide, and have evenly spaced fine hairs along the leaf edges and down the sheath opening. The ligule is short and membranous; auricles are short and hairy. Stems can grow up to 4 feet tall and are tipped with slender, cylindrical spikes that appear to be a series of joints stacked on top of each other. Reddish to straw-colored spikes emerge in May to June, and uppermost joints are tipped by straight awns. Up to 3 “seeds” are enclosed in each joint. DISTRIBUTION: Jointed goatgrass is found in all major U.S. winter wheat production regions – from Texas to South Dakota and eastern Montana, and in portions of the Northwest and Utah. CONTROL: No biological control agents are available for jointed goatgrass, and no herbicides are available that can selectively control it in winter wheat; spring tillage and general grass killers provide excellent control.